The recent passing of artist Ric Campman has been a profound moment of reckoning and reflection for the Brattleboro arts community and for the town at large. Artists give their entire life, as they put all of their energy and available resources into the creation of their work, which is made for the enjoyment and reflection of all who experience it. But some give more than others do, in that they not only themselves create but also strive to open the creative vision of other artists through teaching or mentoring. Ric was one who gave and gave and gave, and his memorial service, which was attended by a capacity crowd at West Village Meeting House soon after his passing, was a beautiful and touching testament to that fact. So many had so much to say in their desire to thank the man and to reflect on how he helped each to open their minds, hearts and their creativity through his teaching at the River Gallery School these many years. Ric was a volunteer, as artists don't have to teach or help others to achieve their personal goal, which is to make their own work. And he gave up much by focusing his energy here in our small town instead of on his own personal success as an artist. Every inspired artist can point back to a mentor or teacher who "gave" them the license to be themselves and create freely. Many will point back to Ric Campman as their creative liberator, and some will pass on that inspiration to other young artists looking for such inspiration. So we cannot measure his influence as a teacher and mentor for much time to come, but we will see his influence in the ongoing work of many local creators who show the fruits of their labors on the gallery walls of the Brattleboro art scene. But an artist's passing is also profound for another reason, and that is that we can see what they did in total and who they were, through their work. Yes, and in seeing an artist's life output we somehow feel that we are seeing it differently, as if for the first time. Art must go into the world on its own. The artist and their words and thoughts will not be here forever to explain to the public how to look. Campman was very aware of this, as his students will attest. Now it is time to look at his work and consider for ourselves, based solely on what we can see, who was this artist and what did he express? There is no easy-to-describe "signature" style to Campman's work. He used a number of subjects as expressive devices, but one can say that the work falls loosely into three categories: self-portraits, landscapes, and iconic objects. Of the work shown during August 2006, the last category comprised the lion's share and could be split into groups again, these being houses, wheels, and trees. Campman freely wrote into, or onto the work, adding content with the words depicted. In some cases these words might be referred to for identification, simply because most of the work was not given formal titles. The self-portraits represented seem to harken back to an earlier time, when he used this subject more often, but the energy in these self-portraits seems to have remained consistent. Rick was well known in town to have a slightly disheveled approach to his definition of hair, and that half-hippie, half-Warhol-esque kinetic mop seemed to capture his intense energy and busily active existence. This persistent bushy foliage topped a figure which seemed to be in a state of what could only be described as a "slow scurry" in his downtown movements, to and fro on Brattleboro's Main Street. But his physical appearance was incidental up close, overshadowed by his intensely blue eyes, which peered into those he encountered, and by his gracious manners and personable conversation. The self-portraits capture this energy exactly while making visual reference to Giacometti's style of drawing in figure and portrait (also in self-portraits). The features come to focus through a mass of busy lines built up expressively and seeming like a hive of bees humming and swarming into the artist's visage. Giacometti used this style in all his subjects equally, but in Campman's case, this type of expression was not stylistic but visually accurate, or at least specifically appropriate. The back gallery, which looks out on the Connecticut River, featured a collection of small landscapes. These intimate works consistently defined the artist's approach to, or use of, landscape as a visual subject. Campman divided these expressive pieces clearly into earth and sky. Some were almost cut in half, top and bottom, having the horizon line near the center of the composition. Looking at these works, usually depicting a sunset fading into night, with a darkened earth below, one cannot help but think of the last works of the abstract expressionist giant Mark Rothko that seemed like dark landscapes and were also nearly split with a central horizon. 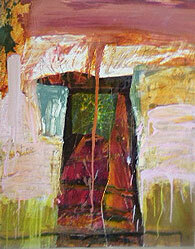 They remained abstract, falling short of giving enough description to be called landscapes. Campman, while working in a similar vein, produced works which are much warmer and deeply rich in expressive color -- in the sky, generally. 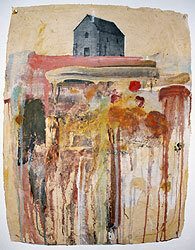 They are more celebratory than Rothko's last works, which many people find depressing. Ric's are intensely worked and expressive views of near-night, more romantic than dark. They might have been what he saw, driving home at the end of the day, between studio and dinner, and he might have been thinking more of Turner's nocturnes than of Rothko. Two aspects noticeable in these pieces are consistent in all the work. They are both Absolute Campman. One is his devotional approach to paper. Ric loved paper in a very unique way. 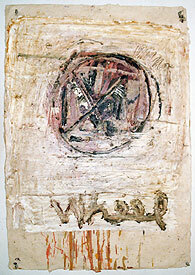 He treated the paper first as textural ground and second as object. Often, when he has exhibited work, it has been installed on the gallery wall simply with tacks, or, in many cases, it would be one sheet of paper attached loosely to another piece. This served as the "frame." It seems that this approach was much like his personality; he disliked "dressing up" the piece and wanted it in its natural state, naked, as it were, or simply without pretension. He was very cognizant of the texture and quality of the paper he was working on and often let those characteristics contribute as one of the expressive elements of the piece. So there are many rough edges, some from the handmade paper itself; some from tearing. Torn paper shapes were used as visual elements. In one abstract composition in the main gallery, three shapes torn from different textured larger sheets are loosely stacked, like blocks, on yet another interesting background sheet of paper. The central shape had a texture created with rubbed pastel; it had a curiously palatable quality, making you almost want to "taste" it. 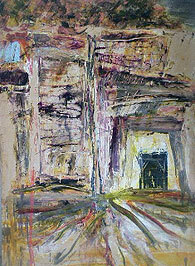 This piece was inscribed, with a shaky hand, "Brattleboro Dec 05" in the lower lefthand corner. That serves as the only title. No frame. No title. The second element that permeates most of Ric's output was the visible amount of time put into each piece. While his presentation was unpretentious and unadorned, he often worked deeply into surfaces and images, building the materials until a moment of "Zen," or simple beauty, was found. The process of working into the paint, or building texture, gives each piece a living "energy," as if the artist's intense gaze could be captured in art materials. This energy attracts the viewer, while gently confronting them. Encountering his art is as it was to meet him on the street. 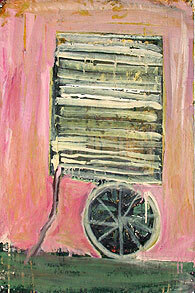 His very engaging presence is alive in each of his pieces. "It is as it is," the work seems to say. Campman's work is life-affirming. Deeply working the images is an important aspect to the works that comprised the largest group of pieces, those previously referred to as "iconic objects." The most repeated of these metaphoric icons is the house. Houses appear as shapes filled with energy (marks, brush strokes, or collage materials; color and texture) or as photos collaged into the image, or just as suggestive abstract shapes: a simple box with a roof or just the box itself. They are all houses. This repeated metaphor seems to represent home, family, love, unity, and the life that fills a house. The looming presence of a "permanent" dwelling does not go unnoticed; each house seems a living entity itself. But one cannot stay at home all the time. One must have wheels. The wheels centrally depicted in a number of pieces are like wagon wheels; you know, sort of like a rolling pizza cut in slices. They are movement and the metamorphosis of thoughts, as when one says "wheels are turning." Wheels were always turning in Ric Campman's head (he would probably laugh to hear that). These wheels radiate the phenomenon of the one element consistent in life: change. 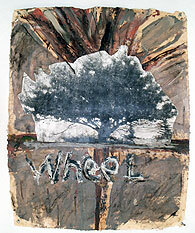 The wheels appear in combination with both the houses and trees in pieces that feature a house on a wheel, a wheel on a branch, or a tree with the word "wheel" below it. Or a wheel by itself, caught levitating slightly above the earth momentarily, perhaps in mid-bounce, as it rolls along on its journey. Trees were the third subjects with which the artist continually identified. One could have described the artist as "solid oak." And these trees do seem self-representing: the figure as a tree, a tree as the body which contains a spirit, or, as Ric might have thought, a tree as me. They are totemic and figuratively iconic when they stand as central figures and seem more cerebral when we see only their branches; again family comes up as a metaphor, as in family tree. For Ric, family was a big part of life, it seems. 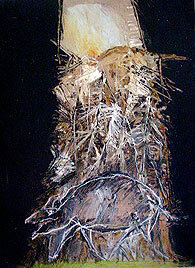 In one small painting in the front gallery, a vertical shape has been reduced to suggestion and looks out from a shower of brush strokes and paint drips, to the left the word "tree" is scratched into the paint. Here expression trumped image. These drips and strokes are tears and laughter; these colors are passion, truth and struggle. Ric presents his "ways of going"
The artist liked to scratch words into the well-worked grounds at times, giving the work added content, both visually and subject-wise. In a small work, comparable with Leonardo's scientific drawings, Campman gives a teacher's clues to those who would seek his creative thought pattern. 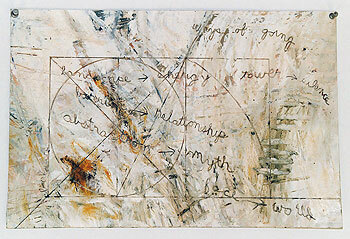 It consists of words connected with arrows, spontaneously scratched into the paint, perhaps with the back of his brush. Starting at the top and reading down, they say: landscape - energy; tower - silence; barrier - relationship; abstraction - myth; face - world. These words appear over a diagram which depicts a circle, a rectangle, an arc, and a few diagonals with the apparent title "ways of going." I suspect that these words allude to his system of composition, but the simplicity and direct spontaneity in this painting are attractive in themselves as visual elements. He was very successful at integrating these temptations to inscribe with the character of the piece, and they do not seem superfluous or contrivance-like. Like a man trapped in the cell of physical existence for a lifetime, he scratched his thoughts on the wall of that cell, his musings and his revelations. They appear like ancient graffiti on the walls of a lost civilization. As all things pass, so will this civilization one day. Forever, the artist strives to release him- or herself from the context of time, but forever is a long, long time. In some of the most beautiful and powerful pieces, featured in the central gallery, we could see the strength of this artist in full bloom. Here I am referring to works which built concentrated masses of marks into strong vertical forms, such as in a work inscribed with the words: "first man under ground." This piece showed a figurative shape of marks, seemingly below the earth's surface, surmounted by a DeKooning-esque face reminding one of the expressive nudes that dominated the Dutchman's early work. The marks alluded directly to Jasper John's "paving stones" series, which featured small shapes filled with parallel marks, organized like pieces of slate in a walkway or wall. Here Campman crystallizes expression, subject, metaphor, materials and style classically. It is a heavy work also, made by a man who knows his days are ending; it is a solidification of experience. 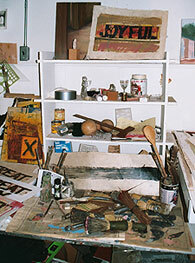 In some pieces featured at the Windham Art Gallery, which Ric helped to start, his approach to collage materials, Xeroxed at times or in-the-flesh, was proven unique. 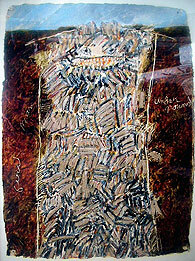 Campman gave the words "mixed-media" new meaning, as somehow he managed not to use the materials as different and complementary but instead seemed to make all materials equal and of the same world. The show at the River Gallery School, Campman's gift to the town and one of the central pillars of the Brattleboro Art Scene, also included some sculptures. Reducing constructions to forms by homogenizing them with white paint or building animal forms out of wool, wrapped and wrapped some more with bailing string or rope, exemplified his approach to sculptural materials. One "llama" carrying a load of sticks had a curious bit of red wrapping on one leg, while a construction in the back gallery was white except for some dried red paint on a paint brush bound by gauze into the entity. The work shown during August was all seemingly from the last few years and was obviously too limited to do justice to Ric's life as one of Brattleboro's creative sons, especially one who affected so many others and gave such interesting qualities to his work. We shall hope for a larger retrospective in the future, one that will allow us to see more clearly the changes that occurred during the development of his life's work and, particularly, how knowing that his life would end -- some eight years before his death -- affected his approach to art making and to life. The words written here only start the conversation about Ric Campman's art, and there is much profundity yet to be revealed. The hallowed halls of any local edifice would become only more hallowed by hosting a life retrospective by the artist Ric Campman. Thank you, Ric! Special thanks to Finn Campman, Ellen Tumavicus, and Donna Hawes at RGS for images used in this article.